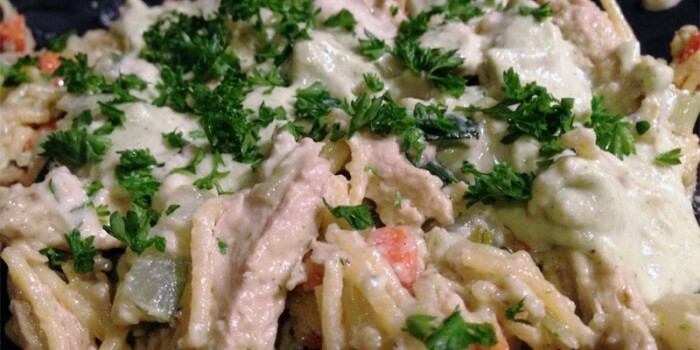 Missing out on your favorite creamy Fettuccine Alfredo dish after going vegan? Don’t fret, plentiful options with what you can recreate with cashew nut cheese and a little almond (or coconut) milk! You can still indulge all you want, and not feel ‘as’ guilty with the caloric intake you’d experience with a heavier dairy-version. 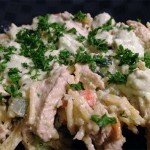 What’s better is you can further experiment with a plethora of pasta, and veggie, combinations. Try it out tonight for a hearty meal you can experience with a friend, or for the entire family. Drain raw cashews (keeping 3/4 water from soaking), and combine first seven ingredients in food processor (cashews, lemon juice, water, almond milk, garlic and olive oil) until creamy-smooth. 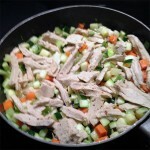 Add vegetable oil to pan, heat and combine chicken, zucchini, carrots, shallots, green onions. Saute for 5 minutes. 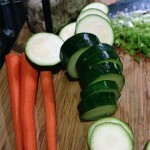 Add cooking wine to veggies and let simmer 1 minute longer. 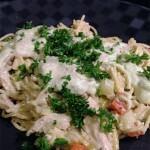 Finally, add cooked pasta to veggie/chicken. Mix, add cashew garlic-alfredo sauce.